Please…don’t judge a book by its cover! Meet sweet Shenzi. 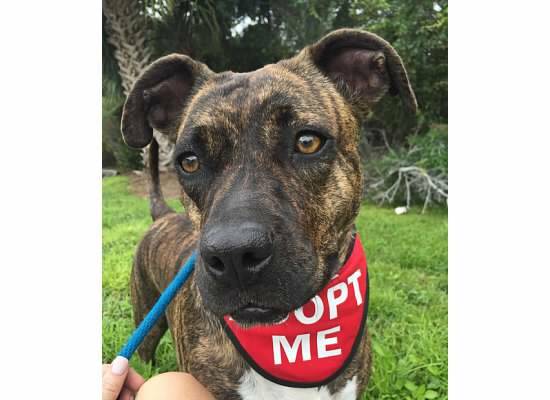 This beautiful brindle is a Plott Hound/Boxer/American Pitt Bull Terrier Mix. All our volunteers have agreed she is a perfect example of “don’t judge a book by it’s cover”. Shenzi has shown us she has so many great qualities. The little twirly dance she does right before we let her out for a walk, her zest for life, and her tail-wagging eagerness to greet everyone who meets her. The patience she has with the children at the adoption events, the kisses she gives as she attempts to lay on your lap, and belly rubs she adores from anyone who will abide. Shenzi is an easy walker who is intelligent, loving and gentle. She is 2 1/2 years young, weighs approximately 55 lbs is house broken, healthy, has been spayed, microchipped and is up to date on all her vaccines. Shenzi may do better in a home with no cats or small dogs (even though we have had no issues with her at the adoption events). Shenzi will be at Pet Supermarket Ponte Vedra this Saturday and Sunday from 10am-4pm. I would love for you to come and meet me I have been waiting in vain for my forever home and would love to help satisfy your soul with my laid back playful attitude!. Call 703-795-3070 for more information or visit the S.A.F.E. website: http://www.safe-pet-rescue-fl.com. Please come meet this sweet ball of wonderful and see why we have all fallen for her! Once you have met and gotten to know her you will wonder how you ever lived without her.